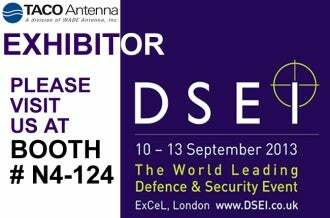 TACO will be exhibiting at this year’s Defence and Security Equipment International (DSEi) show. Please come the company at booth #N4-124. The world-leading land, sea and air defence and security exhibition kicks-off at the ExCeL Centre in London from 15-18 September. For more information, please visit the TACO Antenna website.